How Have The Parties Been Doing? 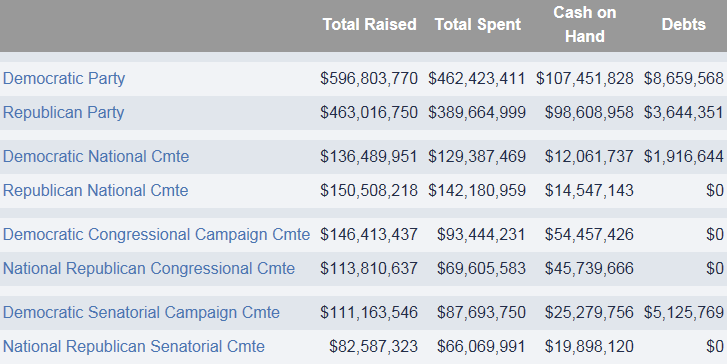 Courtesy of the Center for Responsive Politics, this chart demonstrates how much money has been raised and spent by the Democratic and Republican Parties in the 2013-2014 election season (as of October 16, 2014). Is there anything that stands out to you in this chart? What are your thoughts on this poll? Who do you think the nominees for President will be in 2016? The following ad is from the 2004 Presidential Election. It is an important one since it was the first Presidential campaign cycle that employed the usage of 527 organizations. These organizations come from a section of the tax code which allows groups to subsequently get involved in issue advocacy campaigns. The organizations, however, cannot support a candidate. They can only advocate against someone running for office. In an earlier post, I mentioned that Super PACs are now more influential in political campaigns. In their ads, Super PACs can advocate for or against candidates running for office. They have surpassed 527 organizations in terms of their effectiveness. Should there be a limit to what campaign ads can advocate? This table gives you an idea of how each age group voted in the 2008 and 2012 Presidential elections. 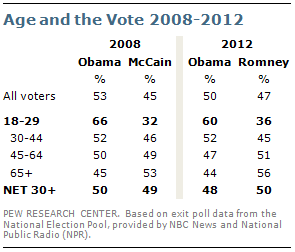 In both cases, Barack Obama did well with voters between the ages of 18-29. With 18-29 year olds, both John McCain and Mitt Romney received less than 40 percent of the vote. Some have said that the Republican Party has a problem connecting with younger voters. Do you agree with that assessment? During last year’s election cycle, we all were inundated by public opinion polls that supposedly gauged how people were going to vote for President, Senate, House, and Governor. In each of these cases, scientific polls were conducted to get those poll results. When you see polling companies such as Gallup, Rasmussen, Pew and the like, you know that the poll is credible. You may not agree with their findings, but what you do get at the very least is a scientific method used to gather information. The practice of push polling, however, is not credible and certainly not scientific. This question was asked of primary voters in South Carolina in 2000 regarding then-Presidential candidate John McCain and his non-Caucasian daughter. The daughter was not black, nor was she illegitimate. She just happened to be adopted from Bangladesh. Using such racially coded language could stir up emotions in voters from a state such as South Carolina. Supporters of then-Governor George W. Bush were have said to be the source of the McCain question. Those who engage in push polling typically do not leave their calling card as to the identification of the push poll’s source. They are negative in nature and are designed to destroy political campaigns. The voter who answers the phone is left questioning the validity of what they just heard. Push polls are not valid in any shape or form. With a special election taking place this March, the voters in South Carolina’s 1st Congressional District are now receiving push poll phone calls regarding a few of the candidates. This Real Clear Politics story elaborates a little more on push polling in the 1st Congressional District and on the practice of push polling itself. For a list of the candidates running for the seat once held by newly appointed US Senator Tim Scott (R), look no further than this site. After reading the RCP story, what are your thoughts in regards to push polls?